Jr. GOYA had a great time last Friday playing spoons, hide and go seek and attending a salutations to the Theotokos service. What a moving night! Family Palm Folding night is coming up next Friday April 19th from 6:00-8:00pm! Enjoy an awesome lenten meal and compete in competitions like smallest cross and more! 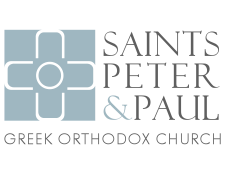 A great pastime of Saints Peter & Paul and a great way to prepare for Palm Sunday and Holy Week. Our Junior and Senior GOYA this lenten season have attended the Great Compline, Pre-Sanctified and Salutations to the Theotokos services before our meetings each week. It has been awesome to not only attend these services, but participate in and explore the vastly different opportunities our church provides us to prepare for the resurrection. Divine Liturgy - 9:30 a.m.